For the suspected meteor crater, see Fried Egg structure. For the style of eggs known as "fried egg" in Nigeria, see scrambled eggs. A fried egg is a cooked dish made from one or more eggs which are removed from their shells and placed into a pan, usually without breaking the yolk, and fried with minimal accompaniment. Fried eggs are traditionally eaten for breakfast in many countries but may also be served at other times of the day. Fried eggs (Spiegeleier) are a crucial part of such traditional German dishes as Strammer Max (the egg is fried on one side with an unbroken yolk, and served "sunny side up" atop an open ham sandwich) or Hamburger Schnitzel / Holsteiner Schnitzel / Fernfahrerschnitzel ("trucker's schnitzel") – a similarly prepared fried egg served on a Wiener Schnitzel. Fried eggs over (or side-by-side with) pan-fried potatoes is another common dish, sometimes served with spinach as a third component of the meal. Some German cooks break the yolk and distribute it across the surface of the white during the frying. All of the above are typically lunch, rather than breakfast, dishes, although eggs themselves (like boiled or scrambled eggs) are a common part of a German breakfast. Fried egg prepared sunny side up is known as "volské oko" or "buličí oko" (bull's eye) in Czech cuisine and they are served either alone as part of breakfast, or for lunch with side of spinach and boiled potatoes. Ham and eggs served with fried eggs prepared "sunny side up"
Cooked on both sides; the yolk is runny and the egg white is fully cooked. Cooked on both sides; the yolk is cooked through but soft and near liquid at the center. The egg white is thoroughly cooked. Cooked on both sides all the way through, with the yolk intact. Cooked on one side only, until the egg white is set, but the yolk remains liquid. This is often known simply as eggs up. Gently splashing the hot cooking oil or fat over the sunny side uncooked white (i.e., basting) may be done to thoroughly cook the white. Covering the frying pan with a lid during cooking (optionally adding a cover and half-teaspoon of water just before finishing) allows for a less "runny" egg, and is an alternative method to flipping for cooking an egg over easy (this is occasionally called sunny side down or basted). Sunny side up eggs are also commonly referred to as dippy eggs or dip eggs by Marylanders, by Pennsylvania Dutch people living in central Pennsylvania, in parts of Ohio, and in Pittsburgh mainly due to the practice of dipping toast into the yolk while eating. This term is also occasionally used in Canada. In Egypt, fried eggs are a common breakfast food. They are fried in fat such as vegetable oil, butter or ghee and served either plain or with other foodstuffs such as tomatoes, cheese, sausage or minced meat with onions and spices; they may also be served with ful medames (slow-cooked fava beans). In India, fried eggs are commonly served alone or as an accompaniment to bread. It may also occasionally be served with dosa, paratha, or roti. During or after the frying stage, they are sometimes sprinkled lightly with condiments such as black pepper, chili powder, green chili, and salt. In central and northern India's English-speaking middle classes and mid-level restaurants, "single-fried" refers to sunny side up and "double-fried" to over hard. Street food parlance uses "half-fry" as a base term with "half fry bina palti" (un-flipped) meaning sunny side up and "half fry palti maarke" or "alti palti" (flipped) meaning over easy/medium/hard where the customer oversees the flip and says when. Mi Goreng noodle served with fried egg and vegetables. In Indonesia, fried eggs are served either as telur ceplok or telur mata sapi (Indonesian for "bull's eye egg") which refer to sunny side up eggs, as telur dadar (omelette) or as telur orak-arik (scrambled eggs). The fried eggs are either setengah matang which is half cooked with still runny yolk or matang which is well done. Fried eggs, especially as bull's eye egg, is a popular toppings for Indonesian fried rice (nasi goreng) and fried noodle (mie goreng), either freshly prepared noodle or cooked from instant noodle Indomie Mi goreng. A simple dish of fried sunny side up egg, served on top of steamed rice drizzled with kecap manis sweet soy sauce, is a favourite dish among Indonesian children. Other than served with rice, fried eggs might be served with bread as sandwich for breakfast. Seasoning include salt and pepper, sweet soy sauce, sometimes hot and spicy sambal chili paste. This traditional full English breakfast includes bacon, fried egg, black pudding, grilled tomatoes, fried mushrooms, hash browns (not traditional), baked beans, and sausages. Fried eggs can be served on toast, or in a sandwich, with bacon, sausages, and a variety of condiments. Eggs are often part of the full breakfast commonly eaten in Britain and Ireland. Fried eggs are often served with ham or gammon steak as a popular pub meal. The egg is cooked on a high heat and hot fat, oil or water may be splashed onto the top of the egg to baste it and cook the white. They are usually cooked without turning over. Sometimes the egg is turned to ensure the white is thoroughly cooked ("over easy", though this is more an American phrase), but the egg is almost always served with the yolk runny. In Portugal and Brazil, a runny egg placed over a steak with a side dish of rice and black beans is called a bife a cavalo, literally "horse-riding steak". A similar dish, with the name bife a caballo in Spanish, is also common in Argentina, Ecuador, and Uruguay (called churrasco); fried potatoes and salad replace the beans and rice. In Chile and Peru, a fried egg is included in lomo a lo pobre, Chorrillana, Paila de huevo, and several other dishes. In Ecuador, llapingachos include a sunny side up egg served over pan-seared cheesy mashed potatoes and fried sausage. In northern Mexico, huevos montados (riding eggs) are served with refried beans and fried potatoes (or french fries). Another common method of serving eggs in Mexico is huevos a la mexicana, which blends fried eggs with diced tomato, onion and green chili pepper; the amount of pepper added is often to order. There are several other egg dishes in Mexico which combine different ingredients: Huevos motuleños (in Yucatán), aporreados (mixed with refried beans), and huevos rancheros (sunny side up eggs served over a corn tortilla, covered with spicy salsa). Also, in some parts of Mexico, fried eggs are served with a fresh tomato, onions, and cilantro salsa. Red chili is optional, as is a blended sauce. In Spain fried eggs (huevos fritos) are a common dish. They are eaten alone, with meat, or with sausages. In this country, a fried egg served with boiled rice covered in tomato sauce is called arroz a la cubana in Spanish and the same dish is served in parts of Latin America, Italy (so-called occhio di bue, transl: ox's eye), the Philippines, and Portugal as well. Poet Nazım Hikmet says, in an interview, that he stayed with a Spanish friend for a month and ate fried eggs almost every day. Spanish painter Diego Velázquez painted a portrait of an elderly lady frying eggs in 1618. Called "medama yaki" (目玉焼き, lit. : cooked eyeball), fried eggs are usually made sunny side up. They may be served with salt and pepper, or soy sauce. Called 계란부침 (gyeranbuchim, 'egg pancake') or more commonly 계란후라이 (gyeran hurai, 'egg fry'). Eggs are fried in cooking oil, sometimes with a sprinkle of salt. It is common to put a fried egg on top of bibimbap or Kimchi bokkeumbap. Sometimes, rice dishes, such as bokkeumbap, are simply made by applying a fried egg on a top of a bowl of hot rice, drizzled with a spoonful of gochujang and sesame oil. Occasionally, salt is added to fried eggs, and served as Banchan, which refers to small dishes of food served along with bap. In Busan area, fried eggs are often served with Jjajangmyeon. 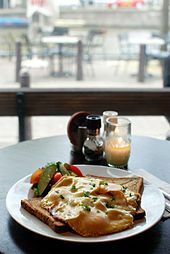 In the Netherlands, a fried egg (spiegelei) is normally served on top of a slice of bread (white or whole wheat), often with fried bacon, for breakfast or lunch. 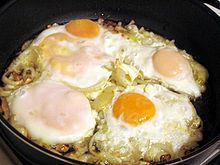 An uitsmijter is a dish consisting of two or three fried eggs, sunny side up. One version is fried together with ham and cheese (uitsmijter ham en kaas), or bacon and cheese (uitsmijter spek en kaas). Another version is placed on buttered bread over a generous slice of cold meat, e.g., cooked beef or ham, and usually garnished with a dill pickle. It is a common lunch dish served in many cafes, canteens, and lunch rooms in the Netherlands. Uitsmijter literally means "out-thrower", and it is also a Dutch word for a "bouncer". What is known as "scrambled eggs" in the U.S. and U.K. is called "fried eggs" in Nigeria, while what is known as "fried eggs" in the U.S. and U.K. would be known as "half-fried eggs" in Nigeria. The mai shai stalls cook scrambled eggs to the point of being heavily crisp. The two most popular fried egg dishes commonly eaten in Russia are yaichnitsa (Russian: яичница), a generic term for pure fried eggs, and omlet (Russian: омлет), an omelet distinguished from simple eggs by addition of milk or other liquids. Yaichnitsa has two main varieties, a glazun'ja (Russian: глазунья), usually referring to the sunny-side up but generally meaning any variant with the unbroken yolk, and a scramble called boltunya (Russian: болтунья), which may have various toppings such as fried bacon, ham, salt pork or other cold cuts, fried bread or onion, or other vegetables added. A common way of preparing both types is to have multiple eggs cracked into a saucepan or frying pan and cooked without flipping. The whites flow together and individual portions are divided up after the whole pan-full has cooked. Nasi goreng, one of the most popular dishes in Brunei, Indonesia, Malaysia, and Singapore is often served with a fried egg. In the Philippines, fried eggs are often cooked like a sunny-side egg but the yolk is half cooked by sprinkling it with salt and oil while being fried, giving it a distinctive pink-colored membrane. It is served in the morning with garlic rice and a choice of breakfast meat such as beef tapa, longaniza, fried milkfish, dried fish, tocino (caramelised pork), Spam, or corned beef, such as in tapsilog and its variants. In addition, fried eggs are eaten in a dish called Arroz a la cubana, which is seasoned ground beef with raisins, cubed potatoes, tomato sauce, and olives, along with white rice and fried ripe plantains. Fried eggs are also a main ingredient in the noodle dish Pancit Batil Patong, where a fried egg is topped over stir-fried noodles. In Thai cuisine, when the words khai dao (lit. "star egg") are placed after the name of a dish, it means that one wants that dish accompanied by a fried egg. The very popular kaphrao mu rat khao khai dao for instance, translates to "basil fried pork on top of rice with a fried egg". Sometimes this is referred to as a "top egg". Fried rice is also popularly accompanied with a fried egg, such as with khao phat Amerikan and khao phat (standard Thai-style fried rice). Another popular way of eating fried eggs in Thailand is to use it as the main ingredient of the Thai salad called yam khai dao. In Cambodia, a common dish is called loc lok, is a fried egg served on top of a ring of spinach, onion finely shaven and tomoto with either a portion of deer or beef and gravy topped with a fried egg either duck or chicken. A fried egg served over white rice, topped with a dab of oyster or hoisin sauce, is also popular in east Asia. Fried eggs are also sometimes used in a Vietnamese breakfast roll. This American dish is usually made by cutting a circle or other shape out of a slice of bread, often using a drinking glass or biscuit cutter. The bread is fried until brown on one side and then flipped, and an egg is broken into the center and seasoned, usually with salt and pepper, and sometimes herbs. The pan is then covered, and the egg is cooked until the white is just set. The cutout center of the bread is often fried as well, and served alongside or on top of the finished egg. ^ Vera Tulyakova Hikmet (1989). Nâzımʾla söyleşi. Cem Yayınevi. ^ van Limburg Stirum, C. Countess (1962). The Art of Dutch Cooking. London: Andre Deutsch Limited. p. 45. ^ "Uitsmijter". The Dutch Table. 3 April 2011. Retrieved 2 September 2012. ^ Kperogi, Farooq (26 January 2014). "Q and A on the grammar of food, usage and Nigerian English". Daily Trust. Retrieved 23 February 2017. ^ "Kra Pao Moo (stir fry pork with basil) for lunch". Athomeinthailand.com. 29 September 2011. Retrieved 2 September 2012. ^ "Khao phat Amerikan". Austin Bush Photography. 16 March 2011. Retrieved 2 September 2012. ^ Kodi. "A "Farangs" trek through a Culture of Food and the Unknown- Thailand". Kodikassell.blogspot.nl. Retrieved 2 September 2012. ^ "Thai Fried Egg Salad – Yam Khai Dao (ยำไข่ดาว)". SheSimmers. 1 December 2009. Retrieved 2 September 2012. This page was last edited on 22 April 2019, at 08:49 (UTC).